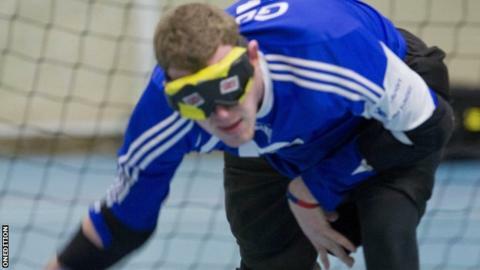 ParalympicsGB goalball player Niall Graham says he is still coming to terms with his call-up for the Games. The 20-year-old from Corby played for the England Under-18s basketball team and had trials for Scotland-U21s before his vision deteriorated. Graham told BBC Northampton: "Two years ago, I didn't expect to be part of this team. It was a surprise but I was absolutely made up. "I'd be lying if I said I wasn't nervous but you always need that." He added: "It's starting to set in that I will be a Paralympian. It's not long now - a matter of weeks and days." The team travel to Sweden to compete in the Malmo Men InterCup 2012 prior to the Paralympics. Graham was an Olympic torch bearer in his home town on 2 July and says the experience has spurred him on. "It was absolutely amazing [to carry the torch]. It has willed me on and it really put into perspective how much I want this [place at the Games]."